Hey everyone! Yes. Finally. 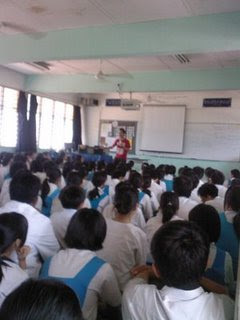 The CF of SMK Seafield has a blog! :D Happy to have you reading now. People!! Spread the word about this blog ya! :D You can link us up at your blog too. Thanks to God and our lovely seniors, we are truly blessed that our CF has been official for many years now. Who are we? : ) Check out our past year pictures.. 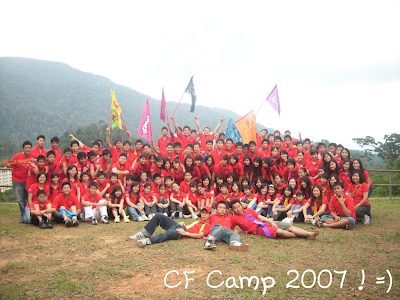 This was CF Camp 2007. 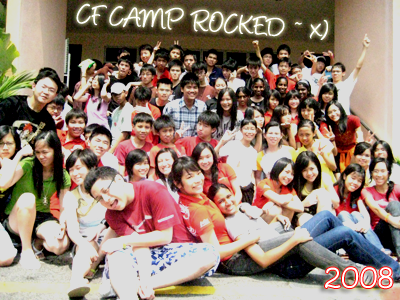 This was CF Camp 2008. This was when Pastor Andy Yeoh came to speak during April 2009, recently, for our Court Case. It was truly amazing when that particular day we had 35 salvations and 27 re-dedications! Praise The Lord! :) All of us really did not expect it and it's really really crazy and amazing how God has worked! It was such a shocking yet wonderful sight seeing those hands lifted up during the response. When Pastor Andy was asking for a response, I was hiding my head on my knees and praying, crying to God, "Surely there must be one or two person! God please one or two! Please God, please!" And then when I looked up. Lo and behold. It wasn't one. It wasn't two. It was 35 hands of salvation and 27 re-dedication! See how Great God is! He moved way beyond any of our expectations. After everything, everyone was just smiling with joy of how awesome God is :D But let us not forget how great God has worked and how even greater He wants to move in CF. Not only in our CF I believe, but all the CF's!!! Let us take that step ahead now for Him. The. time. is. now. Hence, this blog will be constantly updated for any information about our CF meetings, upcoming events, and also to share great awesome testimonies.